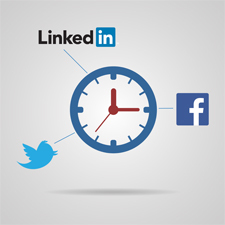 Timing can be critical for many things, including social media for advisors. Trouble is, the information about the best time to post updates is inconclusive. It's both funny and frustrating that every article I researched says something different. I came across one article arguing that the best time to tweet is on the weekends and another article that said tweeting then isn't a good idea. Let me save you some frustration: there is no one best time to post updates. You have to find the optimal timing for you, based on your specific marketing objectives and whom you're trying to reach. Only you can determine this. *These times are localized, so if you have clients or prospects across time zones, consider posting the same update multiple times during the day. More people use Facebook and Twitter in the afternoon, possibly indicating that these sites are used as a break from work. LinkedIn is used more before and after "normal" work hours. Many of the sites' users are busy on Mondays, again indicating a "catchup" period at the start of a traditional work week. Not many of these users spend much time on their social media sites in the mornings. Remember, however, that your target market may not fit this mold. Perhaps you want to reach retirees, stay-at-home parents, or business owners. These audiences may use social media very differently. For instance, you won't find many retirees on LinkedIn, since it's geared toward professionals looking for jobs or networking opportunities. Do they work or are they retired? What do their typical weekdays and weekend days look like? Which social media sites do they use most frequently? Depending on the specific characteristics of your target audiences, make educated guesses about when to post on each site. For example, if I were targeting retirees, I'd start by looking at the habits of those I know and then post when I think they may be online more frequently. For example, I know my (mostly retired) parents and their friends tend to do their exercise routines when they wake up, then spend some time on their computers later in the mornings before heading out for most of the day. Before dinner is another time they habitually seem to be at home and online. Even with extensive research, determining the best time to post updates is still somewhat of a trial-and-error process. Thankfully, there are many tools out there to literally measure your results and make improvements. Facebook. Via your Fan Page, click on See Insights. The Posts tab will show which day of the week your fans are online. LinkedIn. Go to your Company Page and click on the Analytics tab. Twitter. Unfortunately, there is no in-house tool unless you pay for advertising on Twitter. You can, however, use Google Analytics for data about the traffic that went from Twitter to your website. Be sure to read more of our articles about maximizing your business's Facebook, LinkedIn, and Twitter marketing. Even with the use of these tools, you still need to pay attention to when people engage with your posts. Observe when your followers like, comment, share, favorite, or retweet any of your content. This engagement is the ultimate goal and the ultimate measure of success. For example, you may find that followers tend to share topical articles on Monday mornings or comment on personal finance articles at the beginning of the month. Pay close attention; your findings may surprise you. The timing of your posts and updates is something that needs consistent monitoring and tweaking—just like all other social media marketing efforts. With a bit of thought and research, your content will be better positioned to reach the right audiences and succeed. Have you found an optimal time to post updates? Share your thoughts about social media marketing below.